Since ancient times Silver has been considered highly valuable. 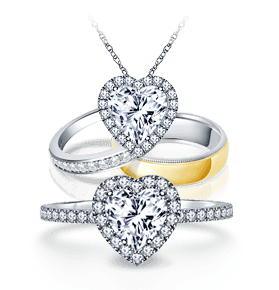 Besides its other miscellaneous uses, its relation with jewelry and accessories has been unavoidable. Silver in its natural unalloyed state is 999/1000 pure, making it highly malleable and difficult to use. Thus in order to be used in jewelry, it is often combined with metallic alloys, such as copper to increase its strength and durability. When pure silver or fine silver is mixed with less than 7.5% of alloy it is known as Sterling Silver. It also improves the metal's hardness and durability without affecting its beautiful color. Sterling Silver therefore is 92.5% pure silver and 7.5% copper as well as significantly more durable than regular silver. Sterling silver jewelry is stamped in various ways such as 'Sterling', '925', 'ster', 'sterling silver' to indicate its quality. The stamping of sterling silver is done to denote superior quality. 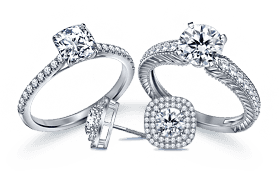 Silver jewelry is prone to tarnishing. It is a dulling effect that naturally occurs when silver reacts with sulfur or hydrogen sulfide in ambient air. It is important to clear tarnish before it causes rust or any harm to your jewelry. 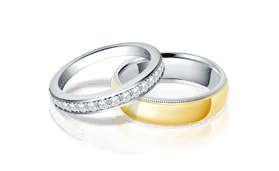 Silver scratches very easily, so it is important to safeguard your silver jewelry from any substance that is likely to scratch it. Regular polishing treatments are the ideal solution to keep your silver jewelry shining. 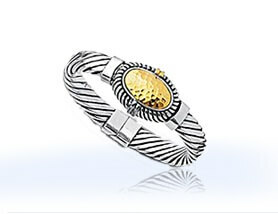 Witness what an exquisite collection of Sterling Silver Jewelry B2C Jewels deals in.